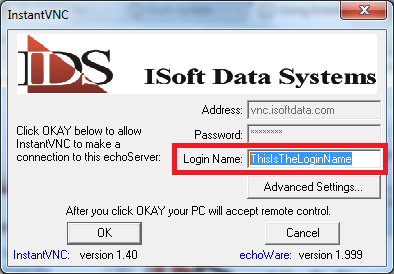 InstantVNC is an application used by ISoft employees to remotely control customer's computers and assist with ITrack installations and offer support/assistance. Another dialog/notice may appear telling you that the publisher could not be verified. Choose Run again. You'll want to let your ISoft support tech know what your Login Name is. This page was last edited on 4 September 2012, at 16:05.